Casey and I seem to be getting busier and busier. We seem to keep adding more and more therapies, specialist, treatments, etc. Every time I think we have everything set up something new gets added to the routine. Everything is going really well, just very busy. We are still making progress (slow, but steady) on Casey’s feeding. We used to barely clear 500cc per day and now on average we are 550-600. It is a pretty huge step for us, and we will continue to move forward as much as we can. We still have some reflux issues (some days are worse than others) but overall it is getting much better. I have heard many people say kids out grow reflux. I don’t think we are there just yet, but it is a nice thought to have. We had Casey’s 1 year pediatric appointment and she is finally done with the RSV shots. She also had a Chicken Pox vac. on the 1 year visit. No more scheduled shots until 18 months. Her length is great, her weight and head are still to small to chart for her age. They are growing though, and she looks healthy. Our current PT is coming twice a week in place of Casey’s normal PT. Casey’s normal PT is on maternity leave until September. Our current PT is actually pregnant now and planning to go on leave starting in September so that worked out pretty perfectly. We had Botox injected in Casey’s legs mid-April and have not seen much from that. Her left leg loosened up a little, but not enough to really bend the knee. Her right leg is still stiff as can be. We have noticed that heat helps relax both legs a little as well, but still nothing has been able to get a bend on either leg. I am not sure as of now if we will try a second round of Botox, or if we will have to start looking into other options. We go back to Ortho in July. During this visit we will decide what we want to do with her legs, and hopefully we can get her foot surgery scheduled. We still think her feet will make a huge difference in her overall comfort. I think once she can roll over without having her feet stop her she will just be so happy. We missed our Neuro appointment in March to review the latest MRI results (Casey ended up in the hospital). We have been trying to get back in sooner, but as of right now it looks like we will have to wait until May 31st to get in for that update. I am sure if there was anything urgent they would have told us on the phone, so hopefully what they found will be good news. We will just have to wait and see. We finally got in to see pulmonology recently. This ended up being a lot more than I expected. They did some xrays and saw Casey has very inflamed respiratory system, and chronic lung disease. In order to try and reduce some of the swelling they sent us home with a concentrator, oxygen and a nebulizer. We use the nebulizer twice a day to give Casey breathing treatments. Then we use the concentrator and/or the oxygen tanks as needed to help Casey get more oxygen into her system. We also were sent home with a pulse ox. This machine monitors Casey’s heart rate and her oxygen level. This is handy to have to know when or if we need to use the oxygen and/or concentrator. They also sent us home with a machine call a cough assist. This applies positive and negative pressure, then pauses in cycles. This basically mimics the bodies way of coughing to force some of the secretions to come up a little easier for Casey. At first we didn’t see much with this, but she is coughing when we do it now. She doesn’t cough up much, but I guess anything is good. We go back in June to do a sleep study. During this study they hope to get a better idea of her apnea and her oxygen levels. Then we go back again later in June to get the results of the sleep study (as well as some sort of apnea treatment I am sure) as well as updated xrays. They are hoping the treatments we are doing now will show a good improvement on her inflammation for the follow up xrays. We are still waiting to hear back from genetics to see if they want to look any further into possible genetic contributors to Casey’s condition. We are very doubtful that they will, but one never knows. We had our 1 year check up with the regional center as well. The regional center is the group that provides our respit, OT & PT. They are keeping all of her existing services in tact. They have ordered a Feeder Seat that should be here in the next couple of weeks. Once it is here we will move OT from twice monthly to a weekly session. In addition they want to start vision therapy. I called one eye doctor after another and none seemed to work with kids Casey’s age, or if they did, they don’t work with her severity. It was very stressful. One of the ladies that runs the UCP (United Cerebral Palsy) suggested I talk with Dr. Bill that is just around the corner. His group The Center for the Partially Sighted seems to be a great resource. They will work with the regional center to first examine Casey and determine what level of sight she has. 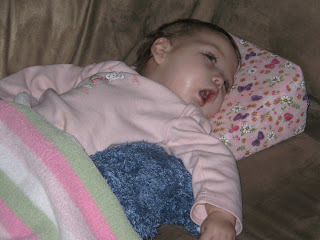 Then they will help us set up the proper therapies to help stimulate her sight, get her blinking, etc. Dr. Bill comes very highly recommended and after talking with him I see why. I am looking forward to seeing what all they can find out. I don’t have a date for these tests just yet, but hopefully early next week I will be able to get something scheduled (hopefully the appointment will be in the next few weeks as well). He did mention that they will most likely fit Casey for glasses. They may be corrective depending on her results, but at a minimum he would have her fitted to protect her eyes since she doesn’t blink at all. How cute will that be?! I have an appointment next week to start Casey on a weekly Cranial Sacral session. Acupuncture has also been suggested. The place we are taking Casey for Cranial Sacral does both, and they may combine the 2 into one session. In addition to all that we have going on with Casey, Tim has been pretty busy too. His back has hurt him for years, and he could not seem to get answers anywhere. He finally went to an ortho that ran some tests (including an MRI and nerve test). It turns out that Tim has a herniated disk. He is in a lot of pain right now and working with the ortho to try and figure out the best way to get it repaired and get him back to his previous active lifestyle. It is really hard on him not to be able to run and workout. I hope they get this fixed and get him out of pain soon. Casey and I are very busy these days. Things are moving forward though, so busy is a good thing. As we find out more about her vision and see how she does with the cranial sacral/acupuncture I will try and post updates. I hope everyone is doing well!